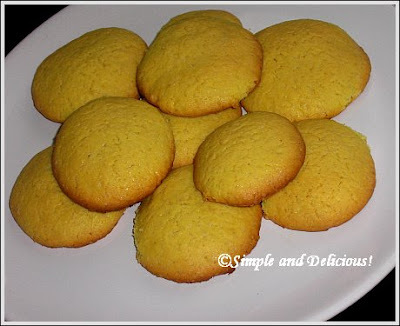 Simple Yellow Cookies | Simple and Delicious ! 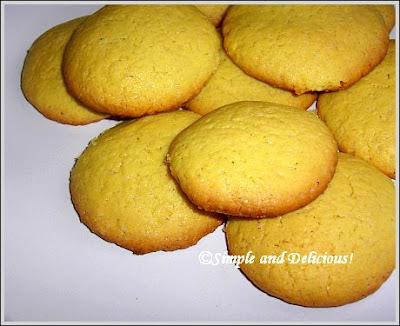 Easy Cookies for beginners from a beginner.. :) These cookies tasted like the tiny yellow egg biscuits that available in bakeries of Kerala. Beat / blend sugar and ghee. Add egg and blend it again. Add the remaining ingredients and make a dough. If you find the flour is not enough (too soft to form dough), add little more spoons. This depends on the size of the egg used. Keep the prepared dough in the fridge. Better keep it overnight. Preheat oven for 15 minutes. Take the dough out . Make small balls and press it between palms. (Or use a cookie cutter).Let them have 1/4 inch thickness. Grease baking sheet with little oil, place the prepared cookies on it, bake it for 15 minutes in 180 degrees. Check and if the bottom side is slightly brown take it out and let it cool.. Sent to the "Yellow food event" hosted by kochtopf.twoday.net on International women's day! looks great and yummy seena,,,U can send these cookies to IWD..details here..
Those are pretty looking! I too love those tiny buscuits available in bakery...i can eat buscuits thats using egg but i havent tried to buy eggs..no shops give eggs in loose..they sell in trays!!!!!! used to love these cookies. really yummy ones. Seena, do you mean those tiny yellow biscuits that are sold in Kerala??? I used to love them so much and have eaten so many during my childhood. Love the cookies. They look so delicious. Wonderful entry. Lovely cookies n yummy bondas too...would love to have them together...something nice n spicy n then a bite of the cookies! !